As the Development Manager at Breast Cancer Action my job is to make sure that we have the resources we need to do our one-of-a-kind work. I know just how important each and every donor’s gift is. And I am especially grateful to our monthly donors, who make sure we have the resources we need month in and month out. My work is personal to me because Breast Cancer Action’s work is personal to me. Work like the compassionate, evidence-based information and resources my colleague Zoë provides every day to people trying to navigate their own breast cancer diagnosis or the diagnosis of a loved one. This isn’t flashy, attention-grabbing work that makes headlines. But it’s vitally important. And it makes a real difference for real people. This is the work that our monthly donors fund. You know Breast Cancer Action isn’t your average breast cancer organization. We’re fiercely independent and refuse corporate funding from any company that profits from or contributes to breast cancer. We tell it like it is and we are not beholden to Pharma or biotech or any other corporate sponsors. That’s why each and every member of our monthly donor group, our Susan Stone Circle, is so important. Together they make sure we have the ongoing support we need to do the work you’ve come to expect from us. 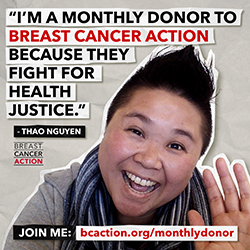 If you’d like to join our mighty group of monthly donors, click here. Again, thanks to every single one of you for all you do to support our work. And many thanks to our monthly donors for having our back month after month after month.